Throw more mugs! This is turning into 100 Mugs in 100 Hours, but luckily I do love to make them. 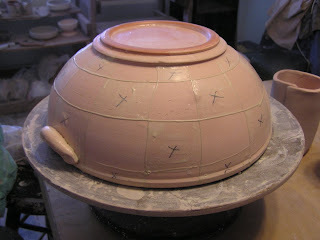 These are simpler forms, fewer throwing marks & stamps, to allow surface for more involved glaze application. 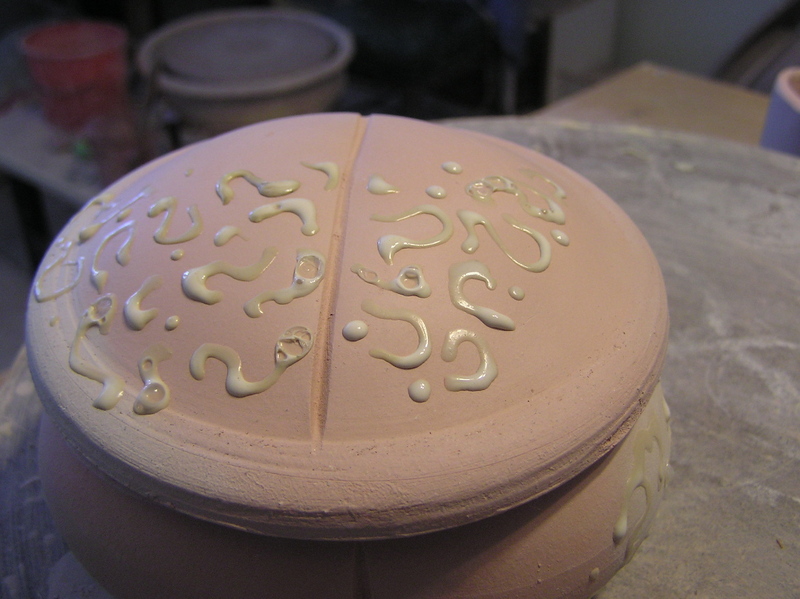 Replenish glazes, and mix up tests. My glaze palette is in flux! (Haha, get it?) I am ditching glazes, like my celadon, that do not do well in soda, and testing some new ones with a wider firing range, due to the unevenness of the last few firings. Also, I have a couple that, while technically cone 10, they really want 11 starting to go. Though one of them is a favorite of mine (Waxy White), it doesn't make sense to push the kiln to 11 -- firing for an extra hour, or more; burning a ton more propane -- for one glaze. 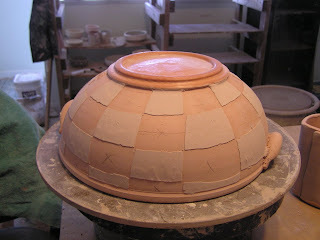 And having to make sure those pots, the ones wearing that glaze, go into the hottest part of the kiln. One of the tests on deck today is an alteration of that glaze, replacing half of the feldspar with neph sy, which will hopefully lower the maturation point to around cone 9. 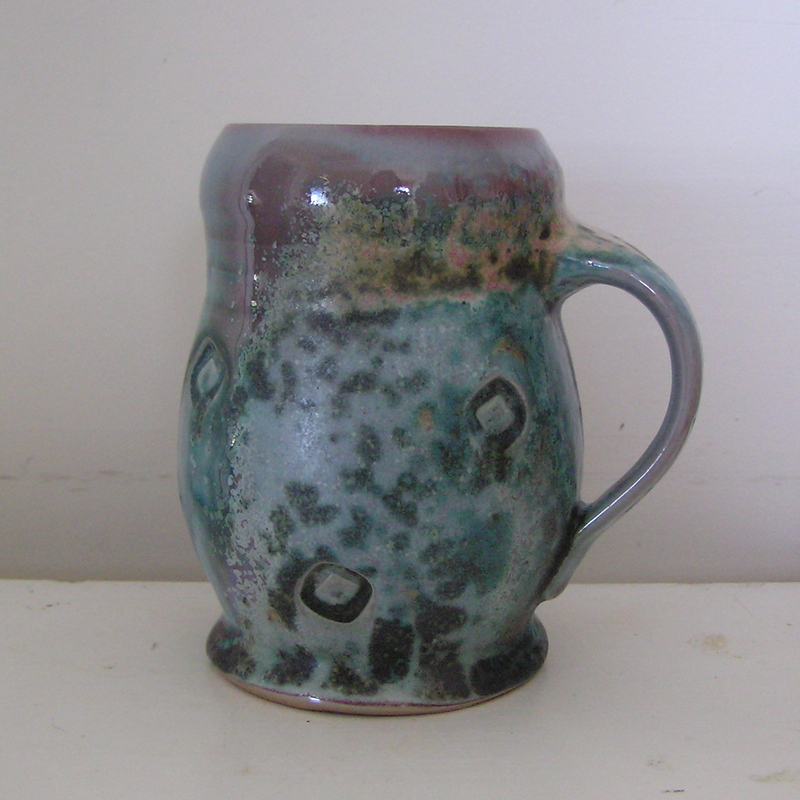 I hope to have more info about the Great Glaze Shake-up in a future post. Replace an element...in my dryer. Is this studio related? Well, sort of. I do use the dryer for towels & aprons, but the point is I almost paid someone to do this, and then thought, If I can replace a kiln element -- and I can, I just don't like to -- surely I can replace a dryer element. Do I know how to do this? Oh hell no. But how hard can it be? Here's my most favoritest pot from last weekend's firing. Unfortunately it's a second...or is it? You be the judge. 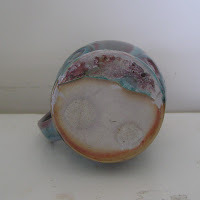 The glaze ran, as a result of a whole boatload of soda and salt, and stuck the pot to the shelf, creating a big, crusty goober on the bottom. 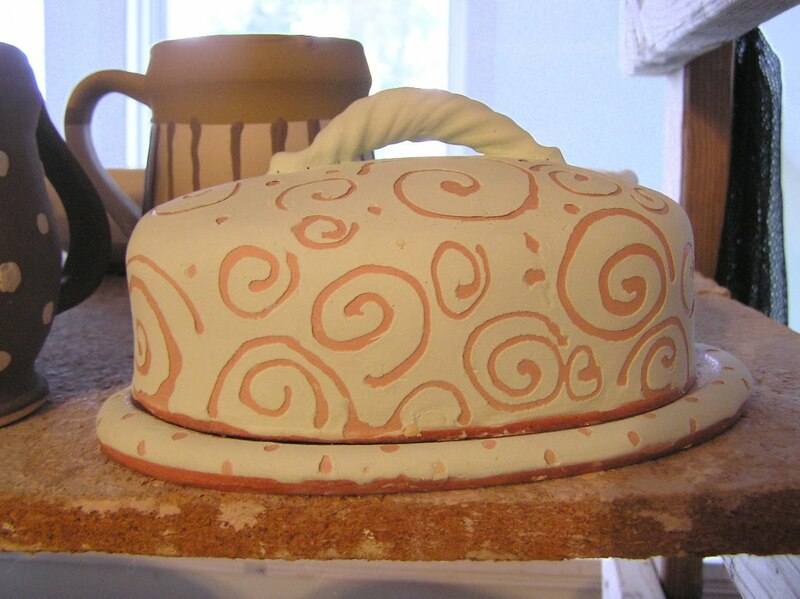 (For the technorati, "goober" is the term for a blob of glaze or soda marring the pot; "woogie" is the name for a bit of kilnwash or a shard stuck to the glaze.) I inherited my father's trusty bench grinder, however, and between that and a Kemper stick, the bottom is smooth, although the goober is still visible. So, technically it's a second, but when is a flaw not a flaw? 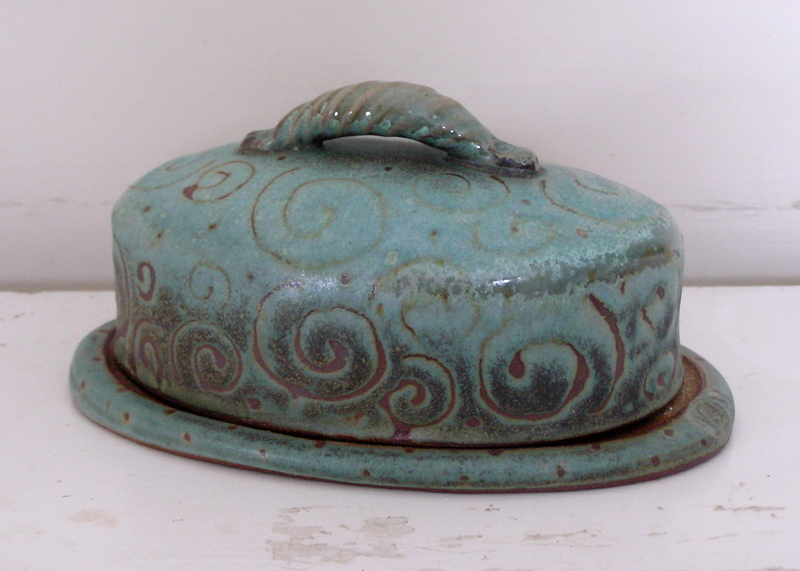 When it doesn't compromise the function in any way, and when the pot is more beautiful for it. You can sort of see which way I'm leaning. I was going to mix glazes out in the shed today, but as it is 12 below zero -- surely a record for this date, in Augusta, Maine! -- I am thinking glaze mixing can wait. Instead, I'll share a secret with you: I have a latex fetish. Resistance is futile. No, wait: resistance is fun! Resistance is doodle. I owe this recent fascination to a buddy of mine at Portland Pottery, whose name I will not mention here, as I do not wish her name to be forever associated by the gods of google with the phrase "latex fetish." The latex resist product to which my friend (let's call her "Kelly") introduced me is a brushable product that comes in a jar (you can find it about 3/4 of the way down the page here.) I find it a bit viscous for my purposes - brushing and trailing -- but thinning with water works well. I've tried wax as a resist, both paraffin and water-based, but they each have their issues. Hot paraffin is hard to control, and harder to remove, when it inevitably runs where you don't want it. 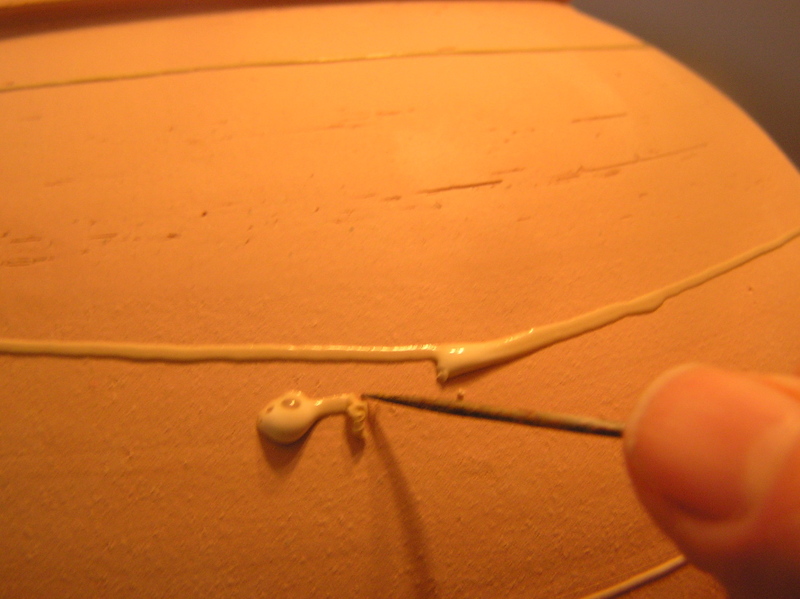 Water-based wax is easier to control and remove errors, but less effective as a resist: it still needs to be sponged off, thoroughly, or you end up with little beads of glaze on your intended clear areas. This is particularly annoying in the case of linear designs, as attempting to clean up skinny little lines can mess up the glaze surface around them. One thing about it though -- the latex resist is funny over flashing slip. 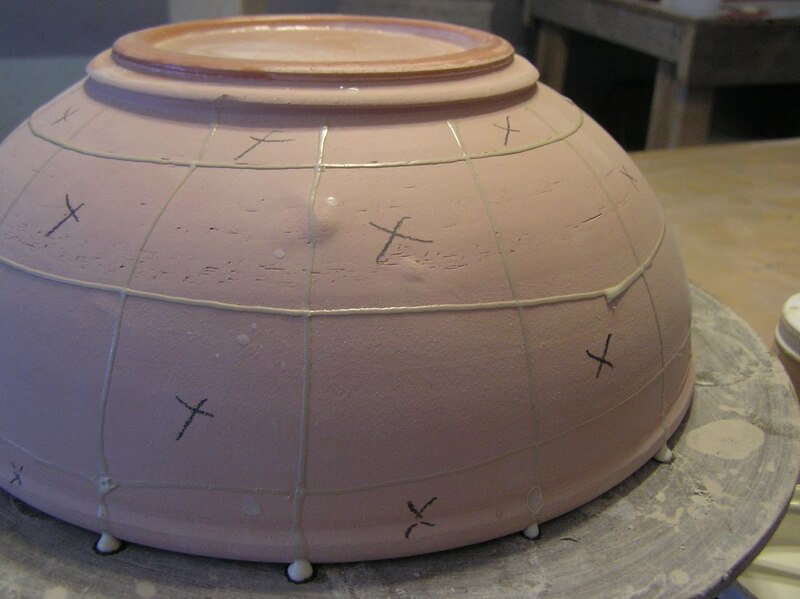 Since the slip is applied pretty thinly to start with, removing the latex takes off enough to change the fired appearance of the slip. So you can't just use it to preserve a straight glaze edge, then peel it and forget it. However, that it s quality you can take advantage of, and utilize latex to make shadow images on your flashing-slip-treated surfaces. I haven't explored this possibility much. Yet. 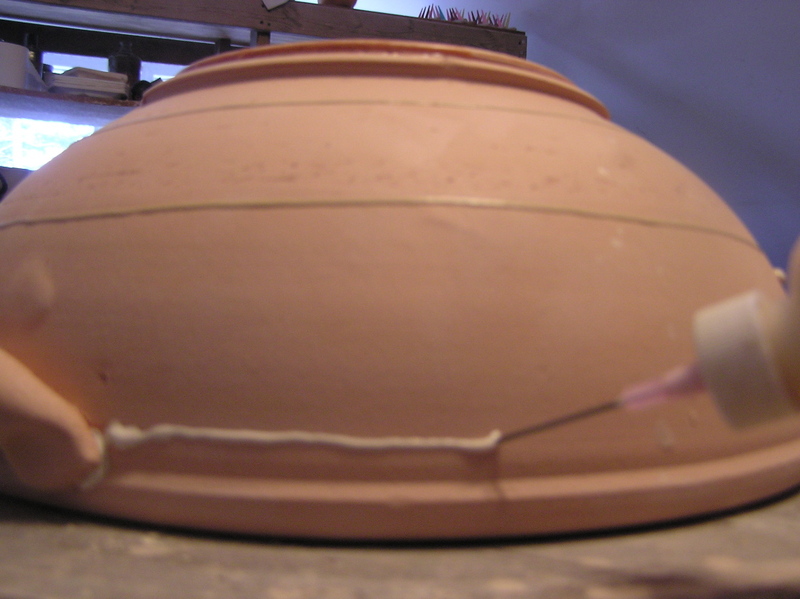 Potters who are sticklers for straight lines can use a pencil and a flexible metal rib to draw them on before applying the resist. Latex will utterly ruin your brushes, so don't use good ones. I use cheap, acrylic-bristle brushes, and run them a couple of times over a wet bar of soap before using, but this only delays the inevitable. I made the mistake of trying this with a good bamboo brush, and it was instantly destroyed, do not pass go, do not collect $200. And, if you use a glaze trailing pen, rinse the nib immediately after use (I blow through it to make sure it's clear) and store it with a piece of wire push through the nib. Otherwise you can kiss that good-bye, also. I was hoping to fire these on Sunday, but the bitterly cold weather has me reconsidering. 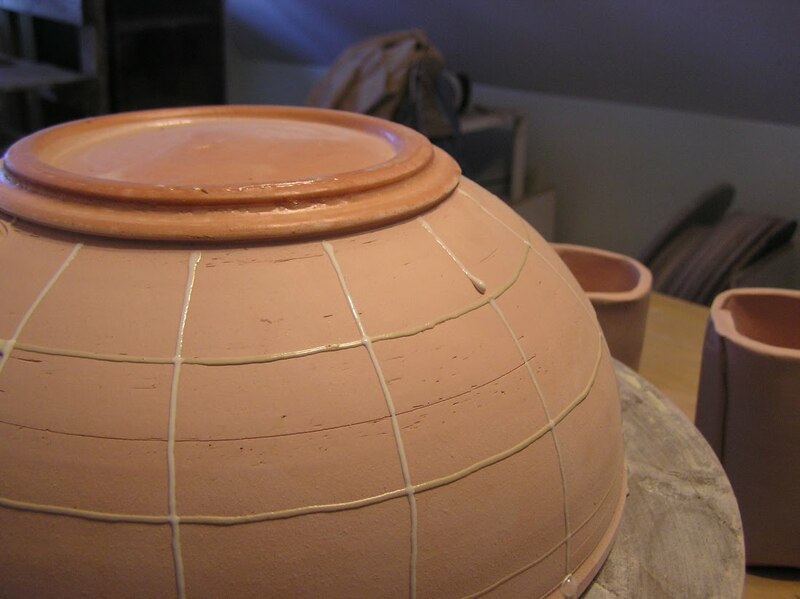 Anyway, I'll post the finished pots when I have them. Ciao for now!